We are proud to offer Huichol Art for sale in our office at Family to Family! It is with gratitude that we bring this art to our Asheville community. The Huichol Indians have lived for countless generations in remote hamlets, high in the Sierra Madre Mountains of Western Mexico. They have never been conquered; their sacred traditions and connection to sacred fire have remained intact in an unbroken lineage. They are one of only a handful of existing indigenous cultures with such a continuous heritage. Their lives are filled with ritual and beauty. Everything, from planting their corn, to embroidering their clothes, is done in a sacred way. Their artwork is alive with their experience of Divine. 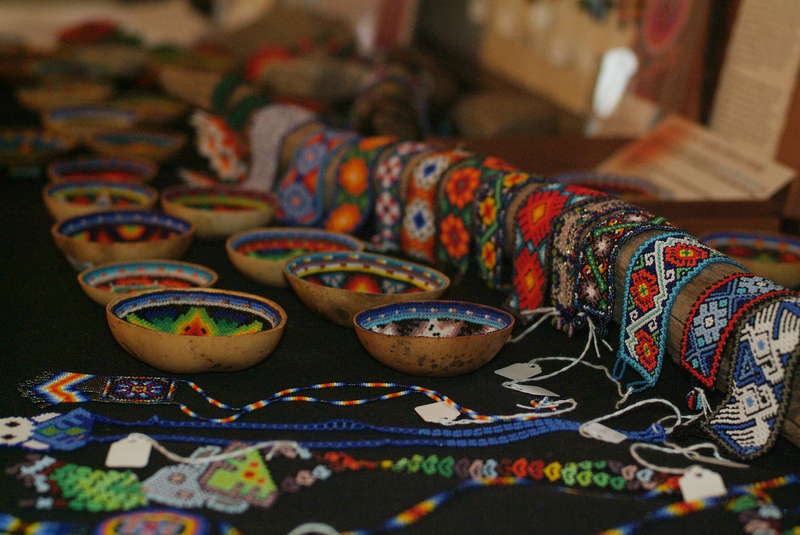 The Blue Deer Center, headquarters for Plant Spirit Medicine and a healing center project rooted in the living traditions of the Huichol shamans, is home to the Huichol Art Project. This project is working to bring this beautiful and unique art to more people. Your purchases of their art allows the artists and their families to continue to earn a living in their traditional way, for the benefit of all people.